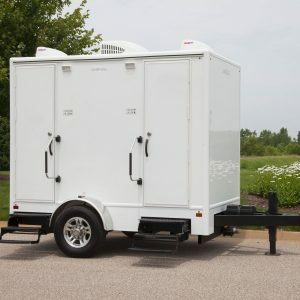 14 ft. Premier- 3 door | Most three-station trailers are 12’, but this trailer is two feet longer and the benefit is clearly felt and seen when using the separate stations. Premier is our most luxurious trailer series. Upgraded from the Signature Series, these trailers are filled with the highest grade fixtures and interior finishes. Features include granite counter tops, beautiful textured wall coverings, built in vessel sinks, bamboo flooring and dark wood finishes. Our 14 ft. Premier trailer is the perfect fit for your upscale event. 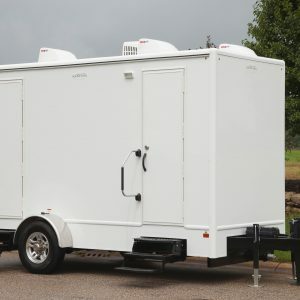 As guests enter this private, 3-Station restroom trailer they are struck by the warm, comfortable surroundings. The soft music and clean, well-lit interior provides a pleasant atmosphere where they can escape from the crowd and enjoy a few moments alone. Our Suite provides unexpected comfort and convenience for your guests. Basic functions, including AC, can be run from just one dedicated 20-Amp service. The water connection is located on the curb side of the trailer and is accessed through an outer compartment. It is a ¾ inch garden hose connection with a pressure regulator that limits the pressure down to approximately 40 psi. The ideal psi range is 40-60 psi. If the pressure from the water source exceeds 60 psi it should be regulated at the source. If no water source is available on location, the trailer comes equipped with a 200 gallon fresh water tank. 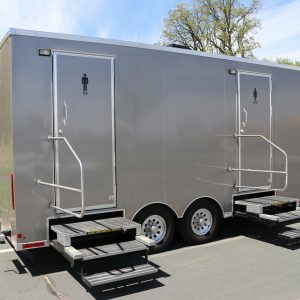 Luxury Restroom Trailer Rental is available in the Minneapolis St. Paul metro area, western Wisconsin and out-state Minnesota. 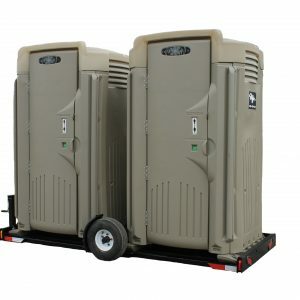 Luxury on a Budget | The Deluxe Flush Pair is an elegant solution for small to medium upscale events. These roomy restrooms will definitely impress all of your guests. Two private flushing restrooms with stainless steel bowls, sinks, soap, paper towel, mirror, interior light, and trash can. Price includes rental of the units for up to one week, delivery, placement, pick-up, and disposal.